Western Kodiak Island, including South Spiridon Bay, and the Spiridon River valley up to Koniag Glacier. See area map (Image file 62 kB). The Spiridon River flows through a broad valley that is moderately sloped with dense alder, grasslands and cottonwoods groves. Steep hillsides and mountainous terrain with alder thickets border the sides of the valley. Alpine vegetation dominates areas above 1500'. Southern portion of hunt area is extremely rugged with permanent snowfields, glaciers, and steep relief. 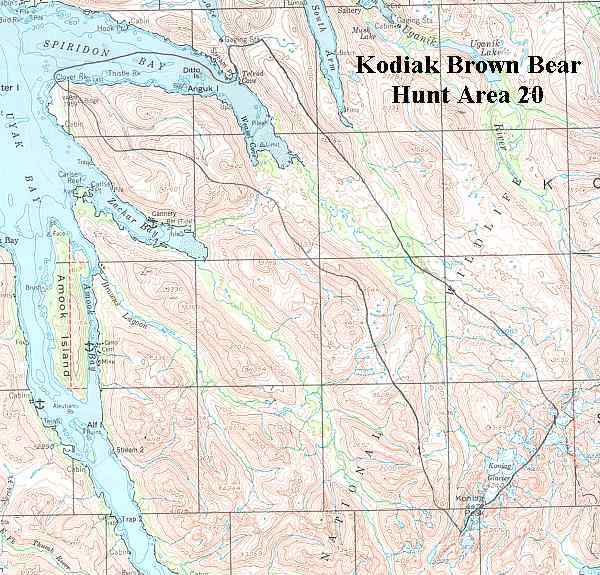 The entire area is within Kodiak National Wildlife Refuge.